Sometimes I see a recipe and get really excited, then read it further and become less excited. Such is the case with an Eggplant Tomato pie recipe I found a few weeks ago. I was all set to make it, but reading it again, it sounded heavier than I wanted, so I kept the concept and went out in my own for execution. I started with an Olive oil crust I found in the NYTs. I made the crust as instructed a day ahead. It refrigerated well so I was able to use it the next day. Half is in the freezer still, so I anticipate another version of pizza soon. For the topping, I roasted eggplant slices with a little olive oil, salt and pepper. Once they were done, I pre-baked the crust (10 minutes at 400 degrees) while I let the eggplant cool and I sliced down the tomatoes. 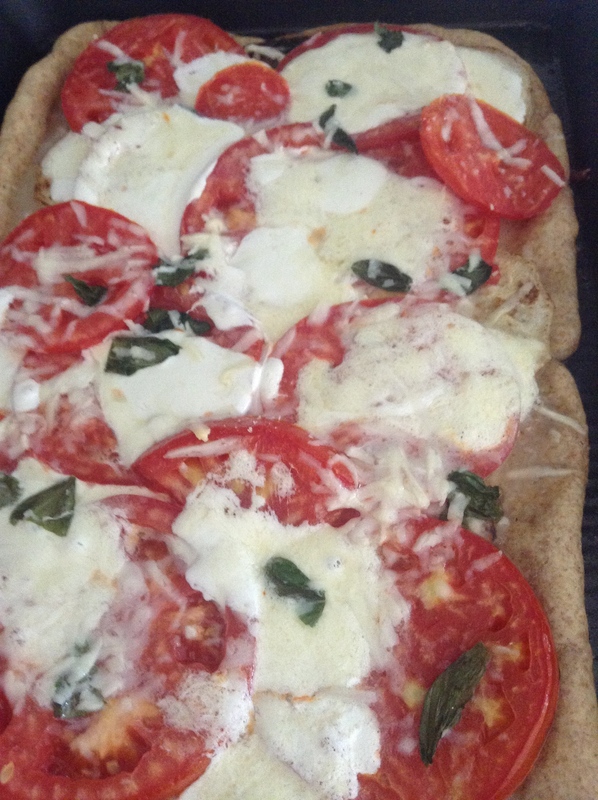 From there is was layering … eggplant, a little reggiano cheese, tomatoes, mozzarella, basil, salt and pepper. Into the oven (400) for ten minutes then let it cool just a little. That was it. Eggplant Tomato pizza. It was good. It’s not a weeknight while working dinner – a few too many steps for that – but a weekend lunch or day off dinner would work just fine. 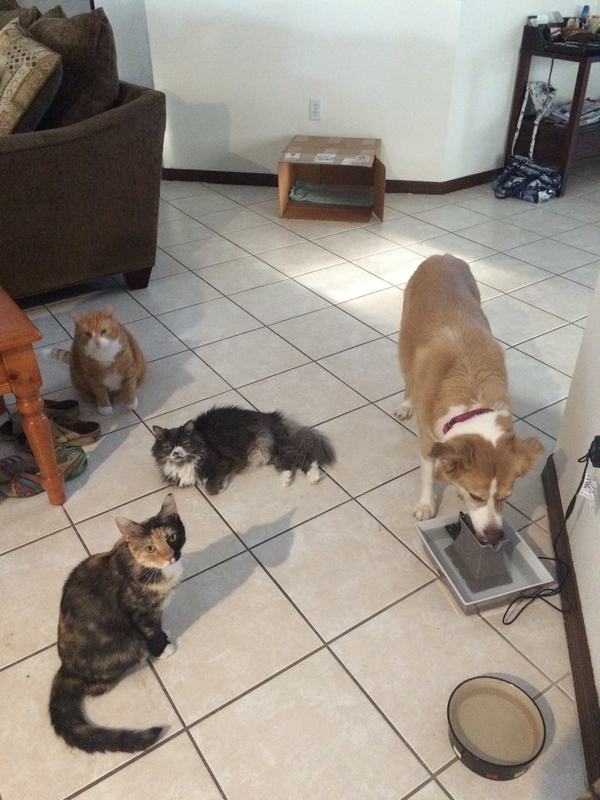 And because I never get a picture of all four furry babies, here it is. I know. Grilled cheese. A dish anyone can make and not screw up. How is this a post? It just is. Not because it is grilled cheese, but because somehow this grilled cheese is more than the sum of it’s parts. To quote Bob when he took his first bite, it is an “oh-my-gosh” good grilled cheese. So I really wanted cheese a few weeks ago and stopped by the cheese shop after the farmer’s market. 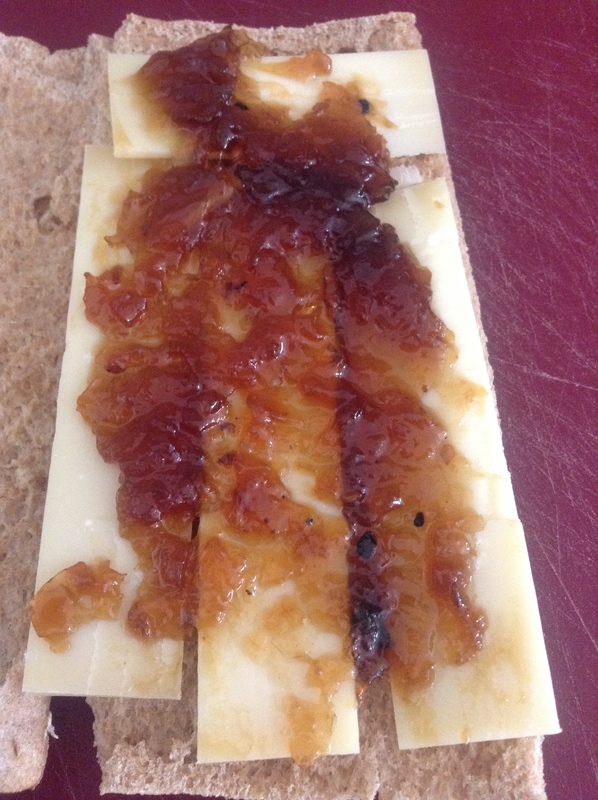 Not only did I pick up a fabulous Gruyere cheese, Louise had me try some smoked onion jam. 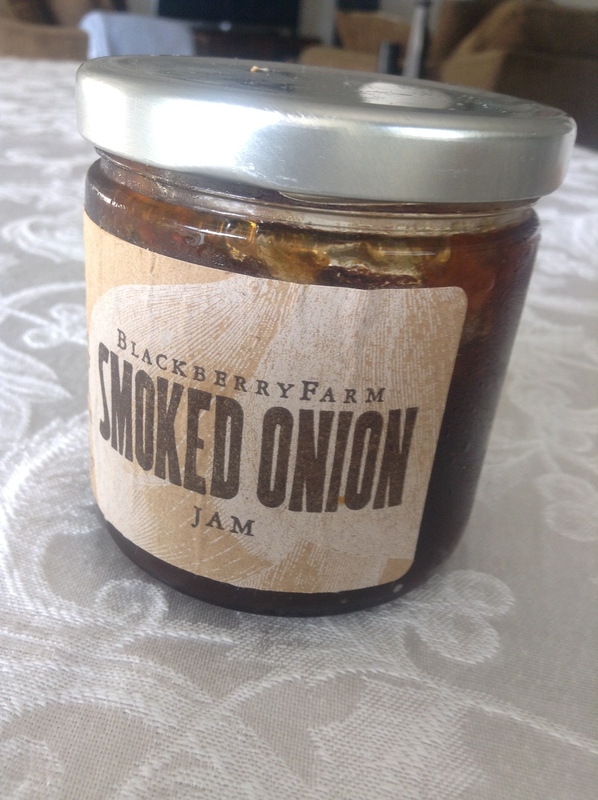 I was skeptical at first, but it was so good I had to pick up a jar. Will actually need another jar when I go back this weekend, but that is another story for another time. The jam was pretty great just on cheese, but I thought it could add a little something to a grilled cheese sandwich. 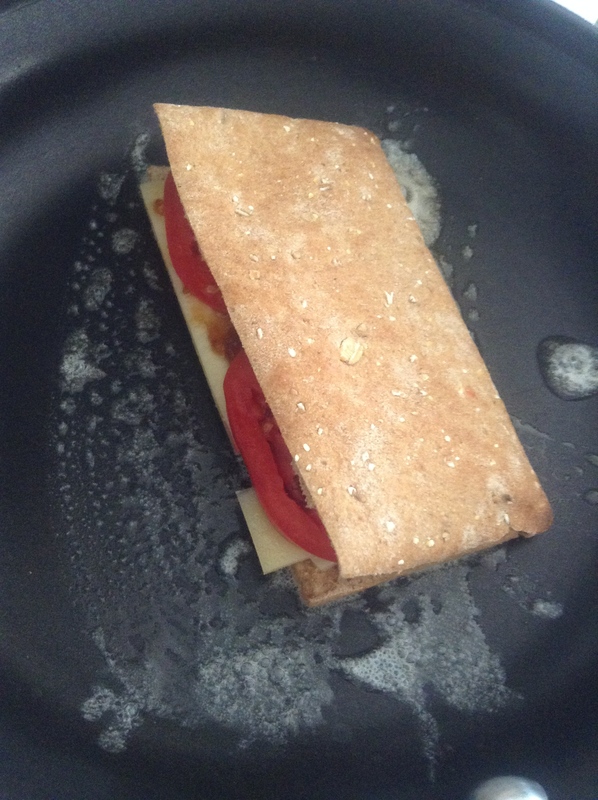 So, I used the pita type bread Mom had left for me, sliced down some of the Gruyere, added a little of the smoked onion jam and topped it all with a few tomato slices. I heated the pan with a little butter and just cooked it like a regular grilled cheese sandwich. The result was amazing. 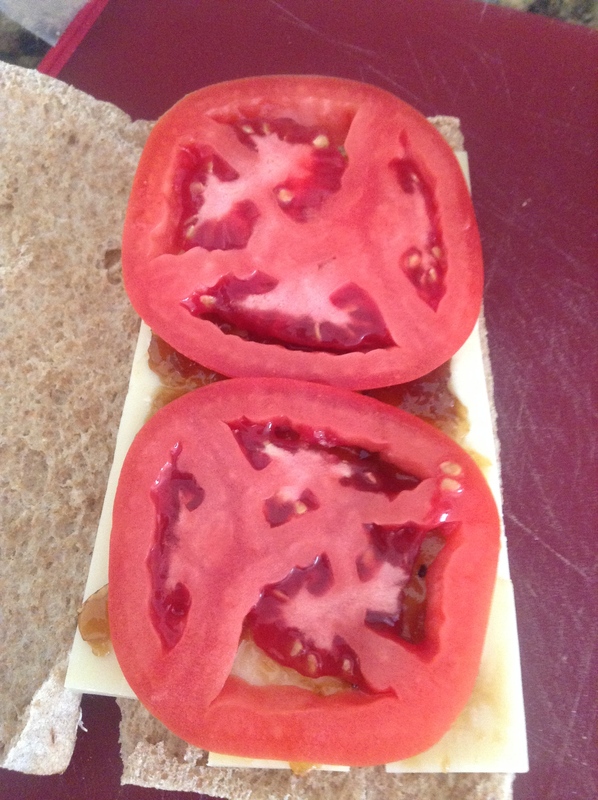 The earthiness of the cheese, the sweet smoke of the jam and the slight acid bite of the tomato. It was pretty perfect. It was actually so good we had this for lunch two days in a row. Yes, me, the person who does not like repeating dishes gladly ate it two days in a row (and may just do so again tomorrow). I have this recipe for French Silk Pie. I love French Silk Pie, but the best recipe I’ve ever found for it is a pain to make, so I don’t make it very often. The pie is also very rich, so making an entire pie for two people, while we could eat the whole thing, is not a good idea. I wanted to make the pie earlier this summer, but didn’t and I still wanted the pie, so I needed an excuse to make it. It is the end of my summer, it is time to get back to work, so why not invite a few people over for dinner to celebrate that … and have pie. You can’t have just pie for dinner … ok you can, but it’s not a very good idea. So I decided to roast a chicken, make some antipasto vegetables and try my hand at a German Potato Salad. 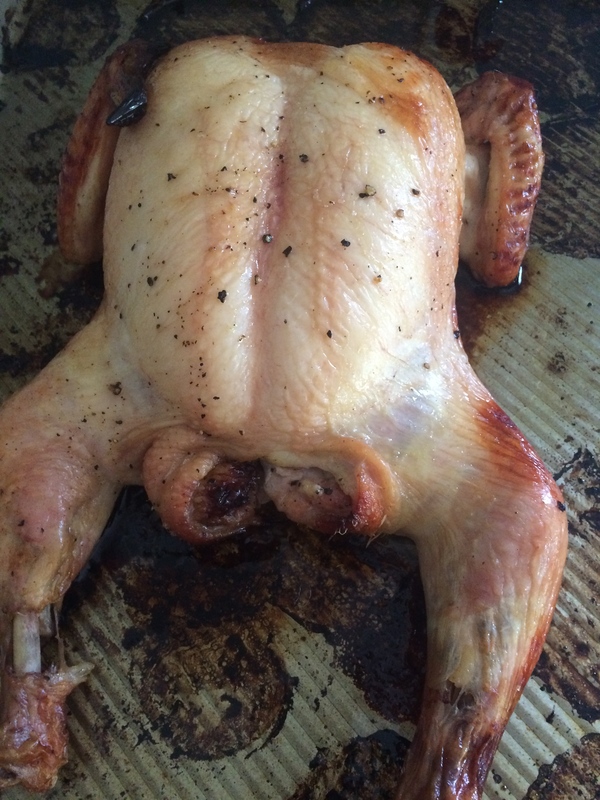 The chicken was interesting. I picked up a whole chicken from Whole Foods last weekend and then set about trying to figure out how to make this thing. It has been a while since I’ve cooked meat, and even longer since I’ve tried a whole anything. I decided to prep the bird like I did the turkey on Thanksgiving (which came out great according to everyone who ate it) but then use the grill to cook the bird, which then required butterflying to ensure even cooking. This was not my favorite task, but after reading a few tips and watching a video or two, I think I got it. It did work, and the chicken came out pretty good. I probably should have removed it from the grill a minute or two earlier, but it was good. 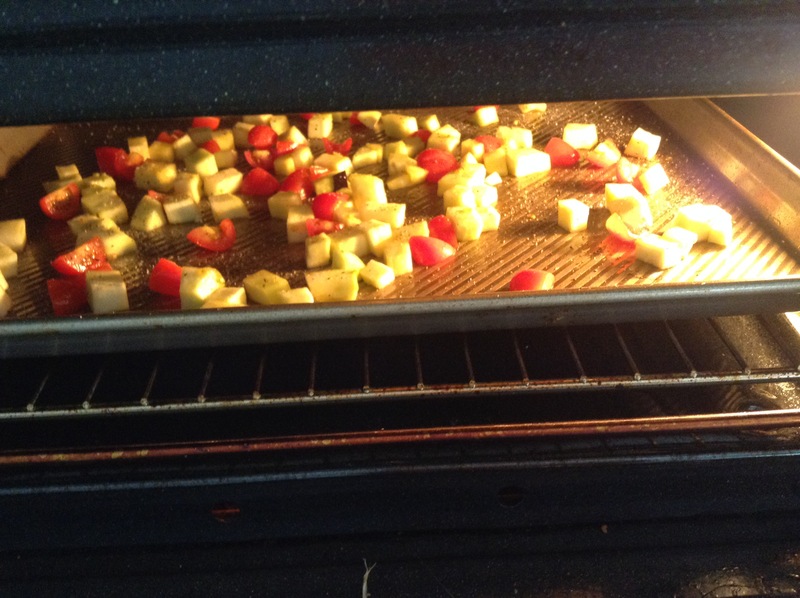 To go with the chicken, I grilled some vegetables – eggplant, zucchini, carrots, tomato and a yellow pepper. I actually let the natural flavor and sweetness of the vegetables speak for themselves – just rub on a little olive oil and sprinkle with salt and pepper. To keep them warm while the chicken cooked (the grill is not that large) I covered them and left them in a 250 degree oven. It worked, they were prefect and tasted really good. Potato salad. I wanted to try my hand at a German potato salad – I figured it could be an alternative lunch option if I could get it to work. I read a lot of different recipes – a lot. 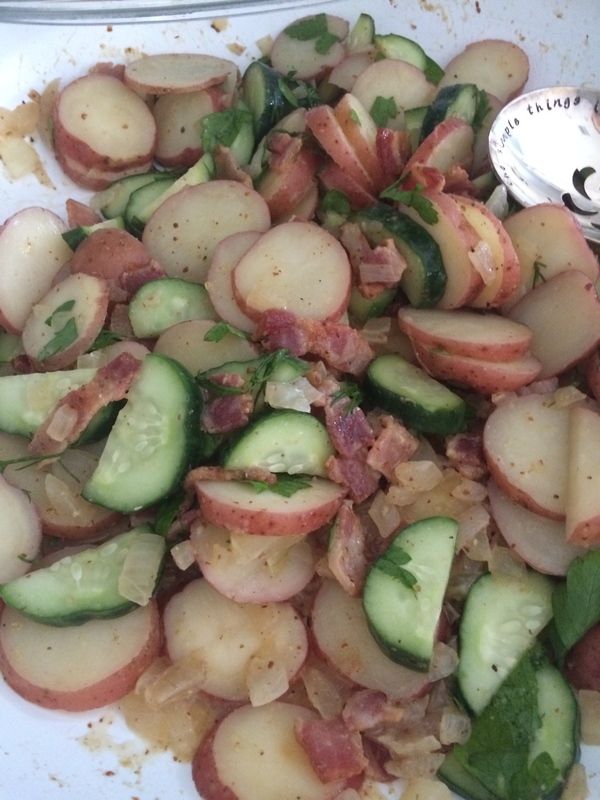 There are a ton of variations of German potato salad out there and they are all very different. I finally decided on a recipe from my Test Kitchen Cookbook (the same place I got the pie recipe from) and altered it a bit. Dill, vinegar, salt and cucumbers to marinade while the potatoes cook. Cook the potatoes with a combination of water and vinegar. Use the marinade to make the rest of the sauce; cook down some bacon and use a little of the bacon fat to cook the onion in then add whole grain mustard to the marinade and mix it with the onion. Add the potatoes and bacon back in, let everything coat a bit then add in the cucumbers. By the time I finished making everything, I forgot to take a picture of a completed plate. 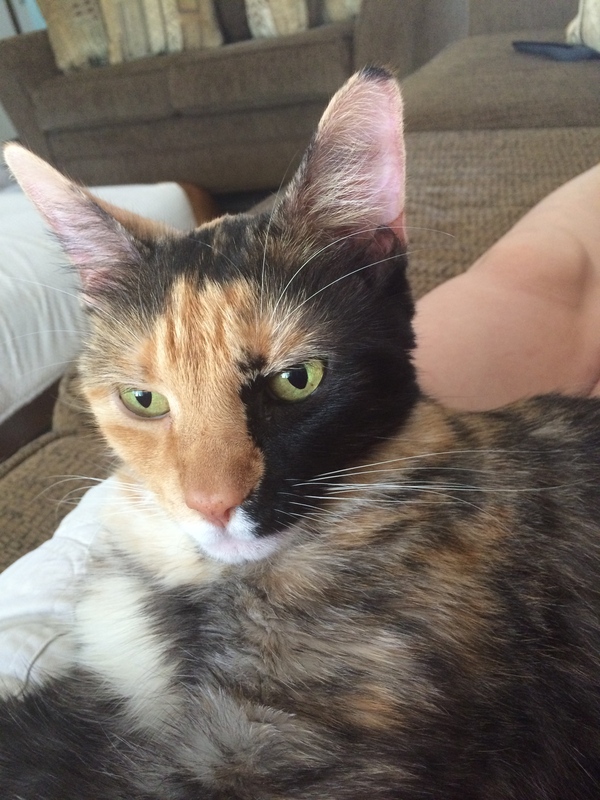 Will have to settle for a cute cat picture instead. The dinner was a success and everyone had a good time eating and drinking and just enjoying the final days of summer. Yes, this is Florida and we will have summer weather until October but we all know it really is coming to an end. I’ve been lazy this last week. Not lazy in the cooking experiment department, but lazy in the posting them realm. I did make a few new things, most of which were fairly successful. Why was I lazy about posting? Part is the end of summer blues (yes, I’m ready to be back at work, but there is also something about knowing vacation is almost over that is a little melancholy inducing) and part is that the app is still crashing if I try to add photos, so I have to use my computer to post. I prefer the tablet – it is way more convenient so I post more frequently when it works right. 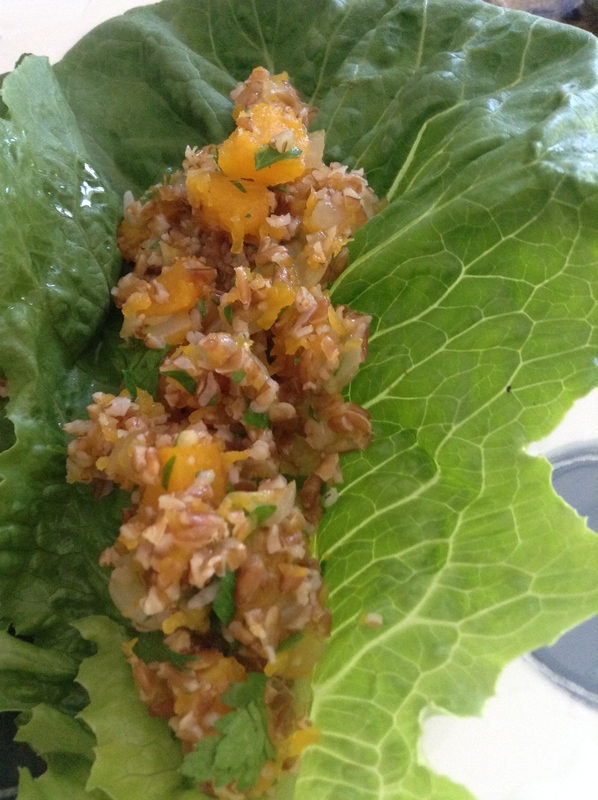 I started with a watermelon quinoa salad with melted cheese. Yes, it sounds weird, but it kind of worked. Not a put in the rotation worked, but kind of worked. 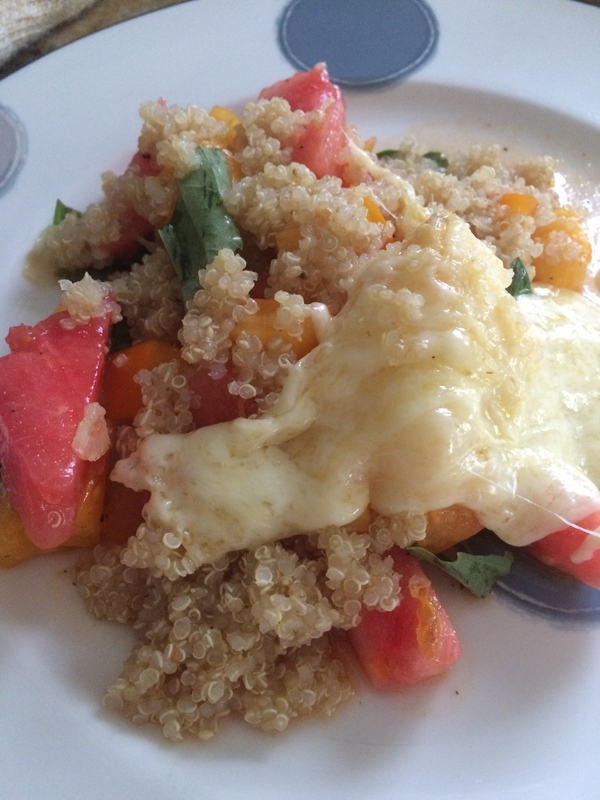 Tomato, watermelon, quinoa, basil, cheese and a red wine vinaigrette. Good, but not great. Way better was the Chopped Asian Salad from the NY Times cooking app. This one was incredible. This is a make again on a regular basis good. 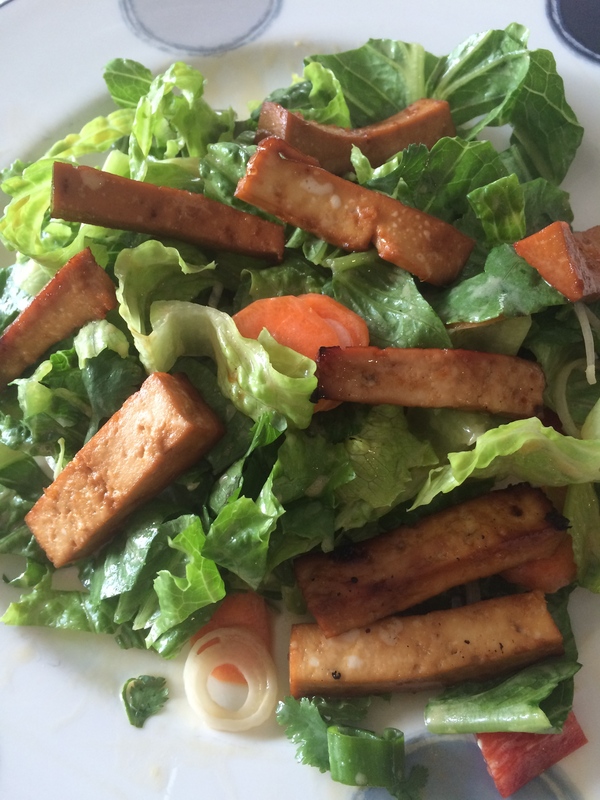 The marinade, which then becomes part of the dressing for the salad was just about perfect. Baking the tofu (and I really only used about 1/3 of a package of tofu instead of the whole thing, but I keep to the rest of the recipe) was easy, although I do like the crispy crust that frying gets it. The squash cakes I made were also good. I was able to use up the rest of the Greek yogurt from the Chopped Salad to make a dressing. I like these and they were fairly light, and I’ve made them before but they are not a regular feature on our dinner table. I had really high hopes for the bugler and squash kefta. Such high hopes. I love bugler, I love squash but this was only ok. This needed something else, another element to add some oomph, but neither Bob nor I could figure out exactly what it needed. So ok, but not a make again dish. 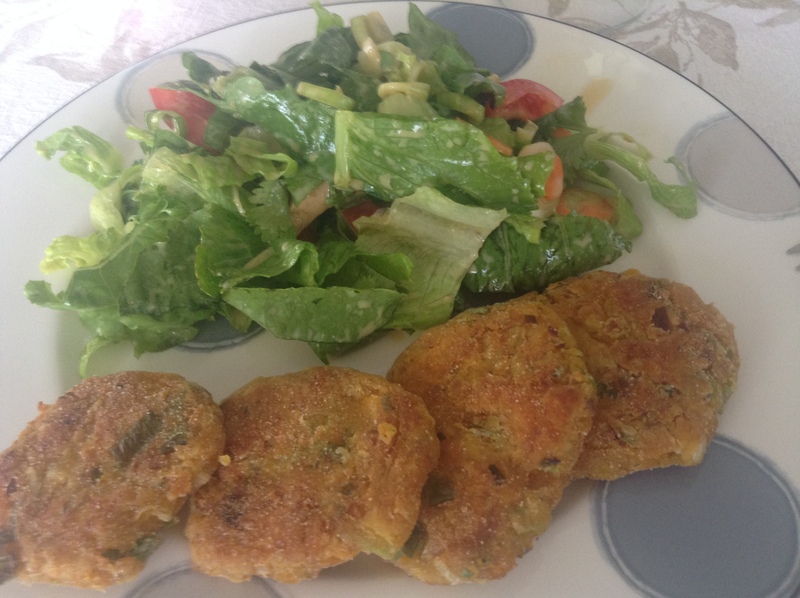 Chickpea Fritters. 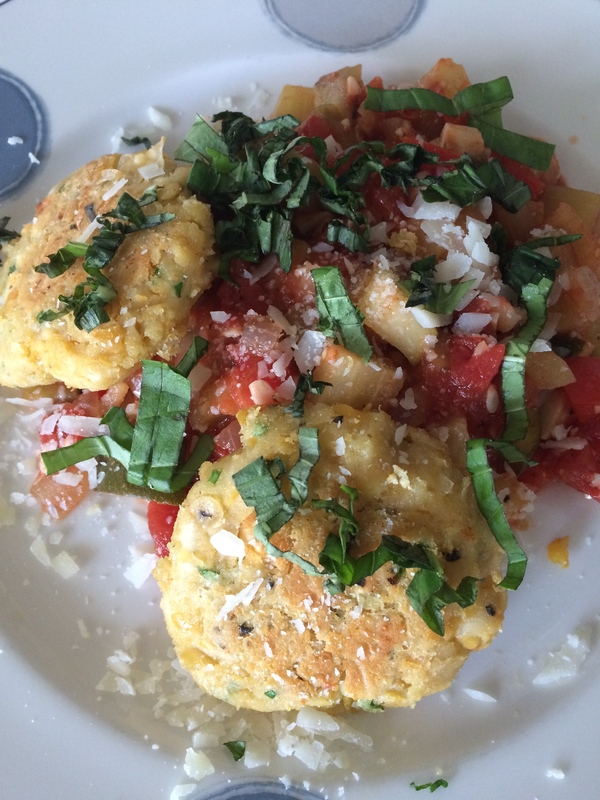 I was a little nervous about this recipe, but I love fritters, I love ratatouille and it was a fairly fast dish, so I went for it. This was the winner for the week. 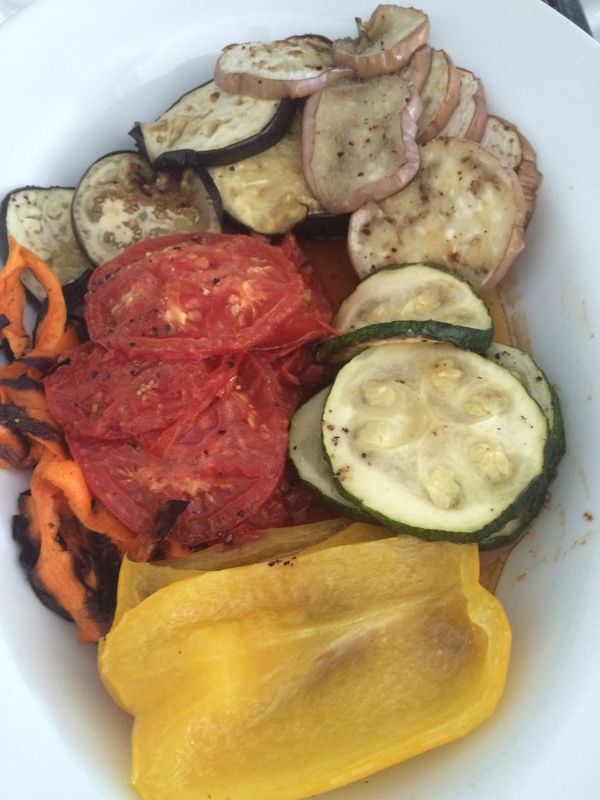 The red wine vinegar in the ratatouille was a surprise, but it really worked and added something to the vegetables. I used a Pecorino cheese instead of Parmesan, but this worked. The fritters were light and flavorful at the same time, the ratatouille was so good and basil on top kept it light and fresh. 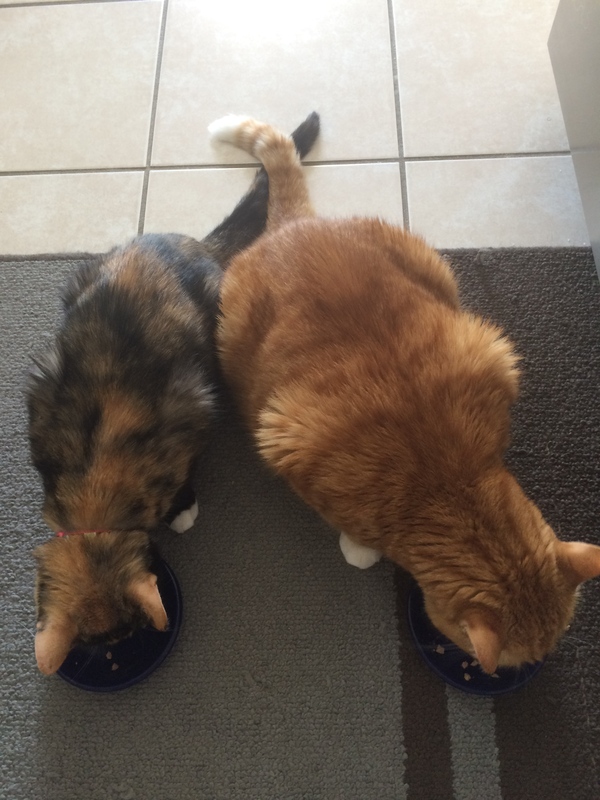 Bob suggested this be a more frequent dinner, which is pretty high praise from him. I have to agree; I really liked this. And we have the requisite cute kitty picture. I looks like they actually like each other, doesn’t it? This week was full of experiments. A few of these I used a recipe for, but some, like the pesto, I just winged it. 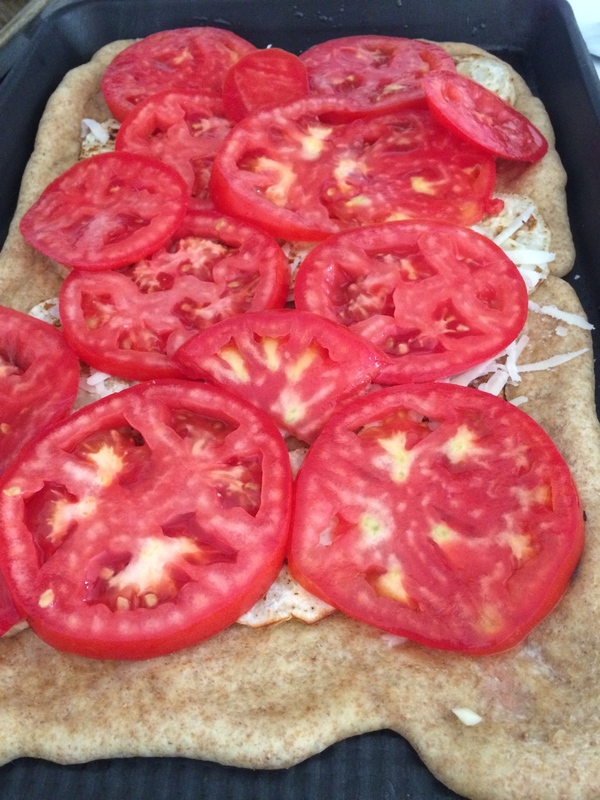 The flatbread was an amalgamation of several recipes, but I didn’t actually follow any of them. Except for the crust. I did use a a recipe for the crust. This is not the most convenient crust recipe – I have to start it early in the day and break into Bob’s beer stash to make it, but it is worth it. It is by far, the best crust I’ve made so I go back to it time and again. But the flatbread. 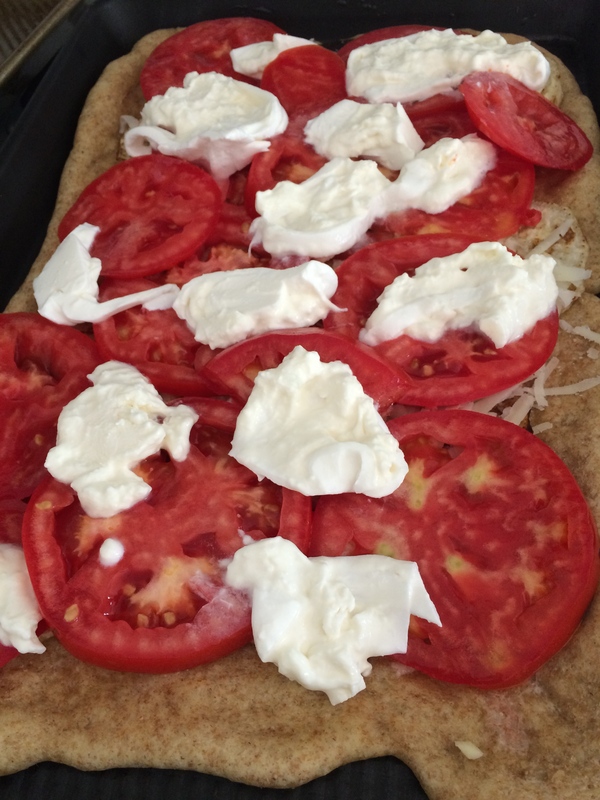 I saw a few recipes for tomato flatbread, some for eggplant flatbread and one interesting on for a ricotta flatbread. I also saw recipes for summer squash flatbread and flatbreads that looked more like salads than pizza, but I thought I could come up with something that would be good on my own. I took the eggplant and tomato, coated them in a little olive oil and seasoned with salt and pepper. I roasted them in a 400 degree oven for about 15 minutes, stirring once to make sure they didn’t burn. 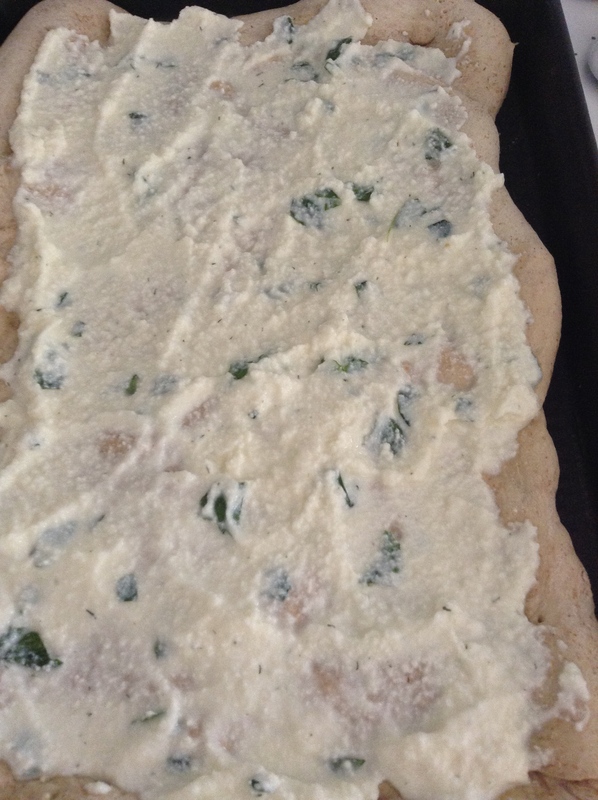 For the cheese, I used 1/2 a container of ricotta (could only find 15 oz containers for some reason) and added the basil, oregano and herbed salt. Mix well. 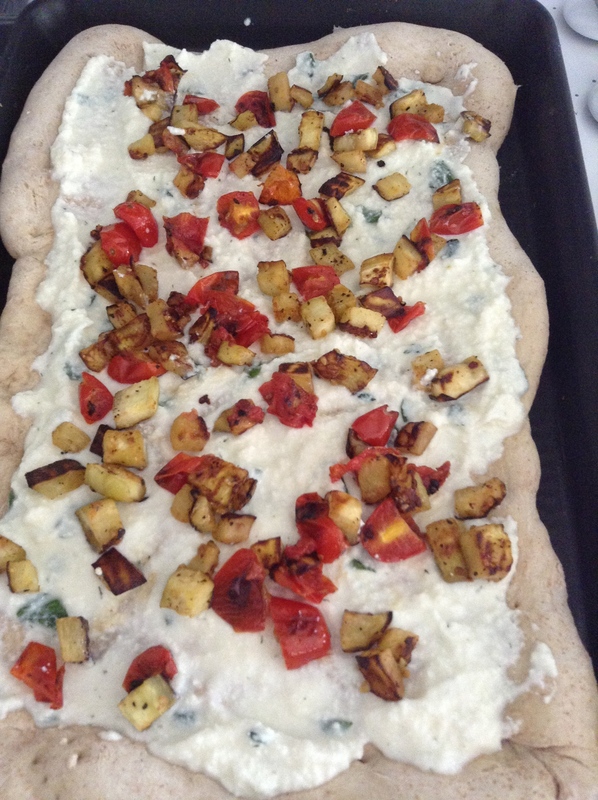 Once the crust is mostly baked, I spread the ricotta over the crust, then topped with the tomato, eggplant mixture. I drizzled the balsamic oil over all of this and then baked for another 20 minutes at 400 degrees. The results were good. I do think another element would work here, some kind of pesto or maybe a tomato base with the ricotta in dollops instead of as the base could add something to the dish. 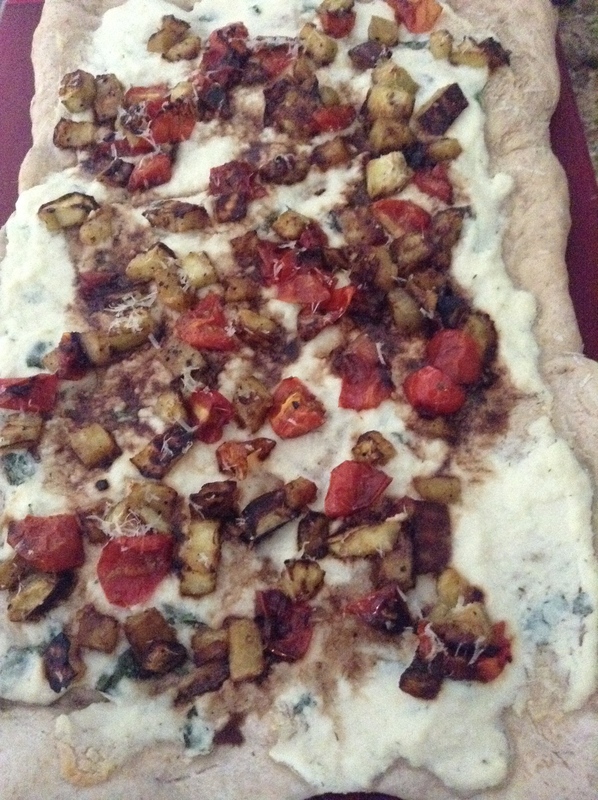 I did like the balsamic on this – it needed the brightness to counter the earthy eggplant and the cheese.